My ex-spouse and I and our two kids, Paul (born 1996) and Miriam (born 2000) moved in here in Fall 2001 at the same time as the other 31 original households. PHCH is a fantastic place to raise children - eating delicious common meals and not having to do dishes is a big help. Our kids attended Fair Oaks Elementary next door, their assigned middle school Pleasant Hill and, through an intradistrict transfer, College Park HS. There are all sorts of pluses and minuses with public schools and a large school district, but I think it worked out great for them both. We found extra MDUSD support when my daughter had to have tutors and independent study because of two concussions in her junior year. In Fall 2018, Paul is starting his senior year at UCLA and Miriam is going to be a freshman at San Diego State. The community helped us have a wonderful party for Miriam and two other cohousing girls who arrived here as babies and now are going off to college in 2018. The village really did help raise them. We originally lived in the largest sized unit here, a 4 bdrm, 3 bath. When my spouse and I separated in 2015, I was fortunate that another smaller unit was available, so I moved 50 feet! Being able to stay for Miriam’s last three years of high school has been a blessing. And the community is very accepting of families changing. I work at a very demanding, but rewarding, job in SF for the SF Department of Public Health. It has been so wonderful to bicycle to BART every day, throw my bicycle in a bike locker, and get on the BART train that runs at least every 15 minutes and even more often during commute hours. I never drive to work and I know that has helped me juggle the demands of work and home. We moved here from Berkeley in 2018. We had longed for more community with our neighbors and a quiet, safe neighborhood with plenty of space to garden, so we were grateful for the opportunity to join PHCH. We enjoy getting to know other cohousers, common meals, Happy Hour on the Old Oak Lawn, and working on community projects. Anne is very active in the garden and can be found writing music and singing songs when she’s not tending to the plants. She works in the Mission at San Francisco at Community Music Center. Sage loves caring for the chickens, making plant medicine from the garden, and cooking. She is an acupuncturist with a private practice in Oakland. We have an orange tuxedo tabby named Oliver Dandelion who loves to watch community life (and squirrels!) by looking out of our windows. My deceased husband Ted and I founded this cohousing community. Next to raising our two sons, the creation of this community stands highest on my list of life accomplishments to date. I’m writing this after 4 years of planning and construction and 17 years of living here. It is everything I dreamed of and so much more. During the seven months of Ted’s illness and death and in the year after, our neighbors who are also our friends supported us in endless ways. I needed folks to go out to eat with, and Ted needed visitors. Those were provided in abundance. When he was home and was under hospice care, folks came to say their farewells. That included every single parent of small children who brought their children. A group of women formed adhoc choirs and came to sing wonderful spiritual songs to Ted. During this entire time, it was a friend-neighbor who communicated what was transpiring with us to our community and to other groups of friends outside cohousing. Support continued for me in the following year; a normally conflict-avoidant neighbor got in my face and told me I had to go get help as in a grief counselor. It didn’t leave me much choice when she put it that way. These are some of the many, many ways we support each other. When a 3-year old says to me, “I miss Uncle Ted”, I am again reminded why I love having this as my home. Today I am enjoying going ballroom dancing several times a week. In our community I volunteer on several committees including the Common House Committee, and I make time to just sit out front and take the opportunity to visit with my neighbors. Unity of Walnut Creek continues to be my spiritual home after more than 30 years. I’ve been studying Non-Violent Communication for the past several years, and now utilize Ho’ oponopono which is an ancient Hawaiian spiritual practice. These all contribute to my well-being, to my spiritual growth as an authentic, loving person, and to making our planet a more wonderful place for all living creatures. My ex-wife Joanne and I joined the group in March of 2000, after the land had been acquired and most of the design work had been done, but about 6 months before construction started. We moved in in November 2001. About 18 months later our daughter Jamie arrived (via adoption from China). PHCH has been an excellent place to raise a child. I like to say that it’s as if Jamie had 42 aunts and uncles looking out for her. When Joanne and I separated in 2014 I was fortunate that another unit became available, and I moved just a few doors away, which makes co-parenting easy. I’m a science and medical journalist, and although I have a full-time position as the editor of a news and information website for physicians I’m fortunate to be able to work from home. My main hobby is woodworking, and I make a lot of use of our well-equipped workshop. As I write this in the summer of 2018 Jamie is about to begin her junior year at College Park High School. She’s interested in aviation and is a cadet sergeant in the local branch of the Civil Air Patrol, a civilian auxiliary of the U.S. Air Force. We joined PHCH towards the end of 2007. We were among the founding members of Cobb Hill Cohousing in Vermont in the late 90s. In between our lives at Cobb Hill and our life at Pleasant Hill, we lived in San Diego, Sri Lanka, New Zealand and San Francisco. We lived in Sri Lanka to work with the Nonviolent Peaceforce from 2003-2006. Ellen's background is rather diverse having worked as the Executive Director for the Center for a New American Dream, the Ben and Jerry's Foundation -- and before that as a psychotherapist. More recently she completed her PhD in Peace and Conflict Studies in New Zealand. 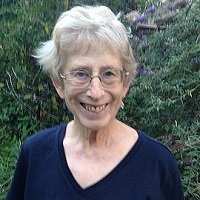 Ellen continues to do research and writing on "Unarmed Civilian Protection/Peacekeeping" as well as volunteer as a Buddhist prison chaplain in a prison nearby. Jan's background prior to working with the Nonviolent Peaceforce was a psychotherapist working with perpetrators and survivors of trauma and violence. Jan served on the faculty of the School for International Training teaching peacebuilding online with the Conflict Transformation Across Cultures Program. He continues to do some international peacebuilding consulting and works locally as a consultant/coach working with individuals and families. More on Jan can be found at: www.janpassion.org/. Between us we have three grown kids: Rachel, Serena, and Adam. We also live with Navi who is a guide dog breeder with Guide Dogs for the Blind. Jan loves to sail, paraglide and play racquetball and ultimate frisbee. Ellen loves to paint, walk, and dance and practices Buddhism. They like to make ceramic art together in the Cohousing art studio. 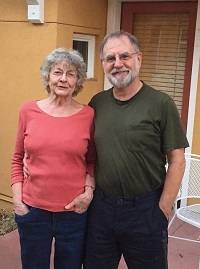 Jeff: I had been interested in cohousing for many years and finally in August 2006 we arrived! I enjoy playing with the kids, jumping in the pool and hot tub, and having unplanned moments. I work as a software engineer and systems manager at UC Berkeley's Space Sciences Laboratory. Along with cohousing I love backpacking, music, and scuba diving (in warm waters!). I have loved living in cohousing from before there were houses here! Part of the forming group, my former husband and I were very excited to join this community and help plan its beginnings. We even shared a home with other future cohousers while construction was happening. Our daughter, Jamie, came along in 2003 and joined an amazing "girl pack" of many girls (and some honorary boys) close to her age. She has loved growing up in cohousing which has given her social confidence and leadership skills. I am grateful for amicable co-parenting with Jamie's dad who also lives at PHCH. I am an elementary school counselor for the local school district, and love my job with children, families and teachers. I play guitar and bring music into the classroom as well as the cohousing community, feeling energized by the musical talent and artistic creativity right here at home. I am a spiritual seeker and participate in a number of religious communities including our local Unitarian Universalist and Unity churches. My favorite places in our community include the chicken coop, our common house great room, and our outdoor gathering spaces such as the Old Oak Lawn. John, Dana, and Maya moved to Pleasant Hill Cohousing in December 2005 when Maya was one month old. Dale was born in 2007, and Leila was born in 2010. We are a homeschooling family, which works particularly well in cohousing. We enjoy the day-to-day interactions that come with living in cohousing, as well as the opportunities for the kids to connect with other children and adults. Dana is a member of the Kid's Committee and the Social Committee. John is on the Maintenance Committee. John grew up in nearby Walnut Creek and never really expected to move back to this part of the Bay Area. After working as a geologist for several years, John went to law school, and now works for a large firm in San Francisco. When he’s not working, John likes to play with the kids, run on the Iron Horse trail, read science fiction, hike in the nearby hills, do carpentry projects, and watch movies. Dana grew up in Palo Alto and went to UCSC as an undergrad. She has worked doing office jobs, as a preschool teacher, and as an SAT and GRE test-prep tutor and has an MA in Clinical Psychology. She is currently back in graduate school studying art therapy, and homeschooling the kids. In her free time, Dana likes to do arts and crafts, sing, dance, write love poems from the viewpoint of various animals, fight authoritarianism, and hang out with John, her cohousing neighbors, and her friends. As of 2018, Maya likes science, robotics, programming, reading, art, and spending time with friends. Dale likes paper crafts, Minecraft, Roblox, Harry Potter, Norse mythology, and hiding from cameras (he is not pictured, for that reason). Leila likes arts and crafts, Minecraft, Roblox, making people laugh, and playing with other kids. We are the Adamo/Akin family and we have lived here since 2014. Karen first heard about cohousing in college and later found a group in Austin, Texas who were trying to launch a new community. Unfortunately that community suffered bad timing as they broke ground in 2008, only to lose the bulk of their members to the economic crisis. As luck had it, our family returned to our home state a few years later, to Pleasant Hill and Concord, only to discover Pleasant Hill Cohousing right in our backyard. Living here has been wonderful in many ways. I have been homeschooling our kids on and off for many years and it has been a great gift to live in a community where our kids interact with varied, trusted neighbors throughout our days. The residents here are among the most conscientious, intelligent, reflective, multi-dimensional group of persons I’ve been involved with in my life. We are not all best friends by any stretch, but of 32 households, there is hardly a one whom I would hesitate to trust my children to in an emergency. I do not know of any other neighborhood in America where that level of trust is a given. Having been a stay-at-home parent in suburban Austin for several years, I know all too well how isolating our American culture is to stay-at-home parents. The past three plus years has been the first period of my life I can say I am never lonely. That is nothing short of amazing, when I stop to reflect on it. The wealth of basic companionship, trust, and goodwill here carry me through when the complex challenges of parenting in community emerge and draw on my energies. For all the gifts of living this way, it is undeniably a lot of mental, emotional, and practical work. Those who thrive here have (or are developing) robust communication practices, are flexible in their ability to think from multiple points of view, balance thinking for the good of the whole with asserting their individual needs, and are comfortable weathering ebbs and flows of conflict over community issues. This year all of my kids will enroll in school, with the boys both attending Fair Oaks Elementary directly next door (can’t beat that commute to school!). Our youngest has attended kindergarten and first grade there, and I am happy to share our experiences with anyone interested in hearing how to make the most of a small neighborhood school that lacks in reputation but offers valuable gifts nonetheless. Our eldest is soon to be in eighth grade at the Contra Costa School of Performing Arts. Her daily routine will likely involve walking to Pleasant Hill BART with her dear friend who also lives here st PHCH, and from there the free Shadelands city bus will take them to school. Our kids are as eccentric as my husband and I and they each benefit from living here in different ways. Our daughter seeks out relationships with neighbors of all ages and she has maintained close connections with individuals in at least a dozen households. Our middle son is more reserved, and is sometimes overwhelmed by the complexity of navigating life here, although he has nonetheless made important connections with other kids and a special few adults. Our youngest is the family firecracker who has kept neighbors laughing from time to time, and he has a longstanding, much-treasured connection with our dear neighbor Pat, one of the originals who has been in community from the beginning. Jeremiah is my dear husband of fifteen years—and he is my favorite quirky, quiet, social justice bent, tech geek who can be spotted tossing our kids around the pool on weekends and walking home from BART looking exhausted every evening around 6:30. I am Karen and before taking post as the family’s full-time child wrangler, I worked for a couple years as a middle school English teacher—a gig I look forward to returning to in years to come. We have two little dogs, each with their own quirks befitting of our family. We live at the end of the path in front of the playground, at the house with the interesting fence. Hi. We moved to PHCH in the fall of 2016. Jim is a chiropractic neurologist specializing in treating people with brain injuries and strokes, problems with learning and memory, and chronic pain. He has also developed and patented an online technology, BrainTiime.com, that balances, strengthens and heals the brain. As you can see, we are both geeky nerds, and we love it that there are so many other fun nerds here. Some of our other interests include meditation; hiking in nature; travel; singing; studying just about anything, but probably most especially spirituality and emotional intelligence; playing with children; being involved in our community. Laura used to be a bilingual teacher and is fluent in Spanish. We've been very happy here, and have loved getting to know our neighbors, having children roam outside freely, taking part in support groups, plus participating in meals and shared committee work. Perhaps the biggest learning for us has been growing our social muscle of how to communicate when there is conflict. This hasn't always been easy for us, but we have grown SO MUCH through learning in this area as a result of living here. We were the first family to move in - when the community was still under construction in Sept. 2001. Although leaving San Francisco was hard for us, we are glad to be here. We go to the city for friends, museums, theatre, and music. Thank goodness for BART! We love the weather out here--sitting on the patio in the evening, seeing stars, fall leaves--and knowing our neighbors. We are both retirees and empty nesters. We enjoy the mix of community and privacy, spur-of-the-moment social interactions, and community "traditions" like the annual Day of the Dead festival. We spend much of our time on volunteer work: Marian with The League of Women Voters of Diablo Valley and Health Care for All - Contra Costa County; Harry with the Contra Costa Labor Council, SEIU 1021 Political Action Committee, Contra Costa Racial Justice Coalition, Lift Up Contra Costa (LUCC), and other local progressive groups. Our daughter Emily, 28, loved growing up in cohousing. She lives in Sacramento, and visits us and the neighborhood regularly. Harry serves on the Cold Water team, and likes to tackle fix-it projects around the community. Marian is on the Risk Management Team, and the Facilitation Team. She has learned how to cook easy meals for a crowd. I was born in England and have lived for long periods in England and Southern Ontario, Canada. On a California vacation in 1984 I met Polly and we were married two years later. I taught elementary school for forty years and retired in 2006. I like to read, run, and solve cryptic crossword puzzles. I also follow the mis(mostly)fortunes of my favorite English soccer team. I was born in Texas and came to California in 1958. I taught English at Amador High in Pleasanton and then went back to school to become a Marriage and Family Counselor and am now retired. I have three grown children from my first marriage, two of whom live in California. Reading is now my vocation and Peter and I belong to a book group that has been going for over thirty years. We are excited to move into PHCH in September 2018 and look forward to building cohousing relationships here. 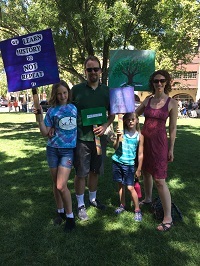 Neal is currently the Minister for Engagement and Justice at the Mount Diablo Unitarian Universalist Church in Walnut Creek and previously served the Unitarian Universalist Fellowship of Northern Nevada in Reno for nine years as its as senior minister. He graduated from Starr King School for the Ministry in Berkeley with an M.Div. Prior to his call to Unitarian Universalist ministry, he completed a B.A, B.Ed and M.Ed. from the University of Saskatchewan in Saskatoon and taught public school there for 10 years. Ruth is a community development professional who most recently has worked managing Older Americans Act funding in California and Nevada, and revitalization programs in Arizona. Fluent in Spanish, she has studied and worked in Mexico, Argentina, Venezuela, and Brazil. She has an MS in Community and Environmental Planning from University of Arizona, a MA in International Trade and business Spanish from Eastern Michigan University, and a BA in Anthropology and English from the University of Notre Dame. Our 12-year-old son is in Grade 7 and enjoys Lego, Minecraft, Star Wars, Dungeons and Dragons, and visiting his grandparents. Our four-year-old enjoys his tricycle and scooter, swimming, conversations, and co-sleeping with Mom and Dad. I'd been following the cohousing movement for years and finally took the plunge, moving here 17 years ago. Although I’m a Berkeley native, I had spent most of my adult life in Southern California. The decision to leave my life in LA was based on the needs of my Lafayette-based parents. Caring for them as they aged, I had the difficult and profound experience of accompanying them as they transitioned, from the stages of aging through their deaths. Some of the high points as an adult: I’ve always been drawn to entrepreneurial ventures. Within USC’s School of Business, I enjoyed the jobs that were challenging and that others ran away from. One of them, much to my astonishment, resulted in a national award. After leaving USC, I created a start-up, based on the premise that trust is the best tool for professionals to use to attract new business. Great idea – yes. Successful – not quite. My family has always been important, and I’m fortunate to have two grown daughters, each with partners, each with jobs, and each with two children. A cacophony of stories, tears, and celebrations. For the last few years, I’ve been involved in finding ways to help progressive movements become more conflict literate. The impetus for this started with my tour of Rwanda, witnessing what I saw as its profound transformation from the horrors of the 1994 genocide to the healing and reconciliation that has taken place since then. Yes, there IS a connection – ask me! What has it meant for me to live in cohousing? It’s been said that it’s the most expensive personal growth experience around. I would add, “the most profound one as well”. Some of those experiences have been rocky, but on balance they have been enormously enriching. And as I look back, the decision to live here has been one of the best decisions I’ve ever made. I've been a resident of Pleasant Hill Cohousing since April 2007. Moving here was a great idea, as I have found a community of like-minded people, and common meals as well as various community celebrations are a delightful way to get to know neighbors better. In 2018, I am the co-chair of the Board and the chair of the Landscape Committee. One of the things that attracted me most to PHCH was the beautiful grounds, but they require a lot of careful maintenance. I spend a substantial amount of time on Community issues. 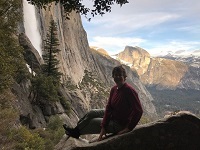 I retired in July 2014 from a job in San Francisco; I was the development director for the Pacific Region of the National Parks Conservation Association. NPCA is the only national organization working to protect and enhance America's National Parks for present and future generations. Now I spend much of my free time quilting, a hobby I began a couple of years before retirement. I also volunteer for the local Ruth Bancroft Gardens and I take classes at Cal State East Bay through the Osher Life Long Learning Institute (OLLI). I have two grown children (pictured with me here) and two grandchildren. They all live in the Nevada City/Grass Valley area. Back in 2001, I was beginning to feel more the isolation of city life after a decade in lovely San Francisco. Lucky for me, that’s when I stumbled across a flyer about then-forming Pleasant Hill Cohousing. One meeting and one potluck later, I was hooked! I was attracted to cohousing because I wanted to live in a place where I know my neighbors – infants, seniors, and all ages between - and we work together to make our little neighborhood home. I have not been disappointed. My favorite things about living in community are common meals, knowing everyone, and both fun and work with my neighbors. I'm on the Facilitation Team and I help take care of the chickens. Outside of cohousing, I volunteer at San Quentin as a teacher of Non-Violent Communication. Together with Susan and Yehudit, I attend monthly meetings of the Oakland chapter of Coming to the Table. For fun, I like to go to the movies and on bike rides, sing, and hang out with my friends and neighbors. I'm retired now for 18 years and I am settling in nicely to what I thought would be a relaxed lifestyle. Of course, because I am who I am that is not the case. I am a potter and we have a small but very complete studio here at Lisa Lane Commons so I am there whenever I have time because that is what truly makes me happy. Because I have 2 children and 3 grown grandchildren who have varied and exciting lives, I take time often to interact with them as they all live close by. I am active here on a couple of committees. I enjoy the little ones, especially the babies, so I like to use a slice of time for them. I hike when I can and there are many places in the Bay Area to do that. I am lucky enough to have a little income from my pottery and so I can travel and I do often. We moved to Pleasant Hill Cohousing at the tail end of 2015. We jumped right in and have loved so many things about life in cohousing: the relationships, collaborative projects, community events, common meals, giving and receiving support, inter-generational living. We’ve also faced many challenges, but on the whole, believe cohousing is well worth it. Originally from the suburbs of Chicago, Sunny went to college in MA (Hampshire College). Outside of community, she works as a Business Partnership Coach for cofounders and business partners, as well as a Couple Therapist and Interpersonal Dynamics Facilitator for MBA students. David has lived most of his life in various parts of California. He went to college at the UC, Santa Barbara where he lived in a housing co-op. Professionally, he is an Actuary practicing in the area of Property & Casualty Insurance. He is a musician and plays classical and jazz piano, and spent a decade as a professional pianist. He continues to play as much as possible strictly for his own enjoyment. In community, Sunny has been on the Facilitation Team, Outreach, HomeBASE. Meals Committee and various Ad Hoc’s (Aging and Wellness, Long-Range Planning, Interpersonal Practice, etc). David joined Executive Committee for his first year, and is a member of the Risk Management Team, Computer Connection Committee, and is Investment Guru. As a cycling commuter, David is also a member of the Bike Shed Committee. We, with many others, have been very involved in efforts to address and help ensure the long-term sustainability of the community. We have family in the area, but no kids of our own, and our indoor-only cat who is quite spoiled can do tricks. For fun, we enjoy West Coast Swing dancing, and hiking and games. Our current home away from home is Kauai (North Shore, Hanalei). I have had cohousing in my sights since the 1980s and finally made that dream come true in January 2009. One of the best decisions I've made. I love knowing my neighbors, both as friends and as partners in maintaining the community. Transitioning to the suburbs and living in community presents many challenges, but they are far outweighed by the pleasures of shared meals, activities and friendships at PHCH. I grew up in Berkeley and lived in Alameda for many years before moving to PHCH. I am a retired reporter who is busier than ever working for the community (Landscape and Security committees), making art quilts, volunteering at a nearby food pantry and traveling, particularly to Latin America. My children are grown and (fingers crossed) on their own, but with no grandchildren on the horizon. So I love watching the little ones grow and learn in this wonderful place to grow up. I've been here since we found the site (2 years before move-in) and I'm very glad to have been part of forming our community. That was one of the most exciting things I've ever experienced -- watching our community take shape physically (the buildings) and interpersonally. After almost 18 years, there have been a few surprises (some good, some hard) but I'm very happy here and I can't imagine living anywhere else. I get a lot of pleasure out of being part of a community; I feel that I am "known" in a way I've never experienced before. I love my cozy house with the clean quiet hydronic heating, the big windows that let in lots of light, the natural materials (e.g., wool carpet and marmoleum flooring), the effective soundproofing so that I only rarely hear my neighbors. I am happily living without television because there are so many other things to occupy myself with. And, even though there are lots of activities going on, I like the sense of freedom to participate if I want to but knowing that if I don't, it doesn't mean others won't have a good time. In 2015 I retired from UC Berkeley where I worked for 20 years at the Career Center, managing the website and other techie projects. I'm enjoying retirement but maybe a little too busy with various activism projects including: Health Care for All, Contra Costa chapter (advocating for single payer healthcare in California), the Oakland group of Coming to the Table (with Sheryl and Yehudit), SURJ - Stand Up for Racial Justice (newly formed Contra Costa chapter), as well as many cohousing responsibilities. I try to balance that with fun things like a women's singing group in Oakland, movies, spontaneous Happy Hours with my neighbors, getting outdoors for walking or biking, and looking forward to some travel. I'm the community bookkeeper and a member of the Financial Advisory Team. I'm chair of the Outreach Committee which means I'm the contact person for outside inquiries and I'm the webmistress for this website. And I'm temporarily co-chair of our HomeBASE Committee which helps find new community members when we have an available unit. The Barr-Wilsons (Bdubs) originally hail from both the east and west of Washington State from Prosser to Kent. Susie and Ben met at Western Washington University where we worked in the office of admissions with an inviting crew of passionate students who helped usher in prospective students. Susie graduated with a degree in Recreation that she has put to good use as a program and challenge course manager at Lazy F Camp and Retreat Center, youth director at a United Methodist Church, program coordinator for Girl Ventures in San Francisco and more. Ben graduated with a degree in math and physics education and since spent the past 15 years crafting educational experiences that encourage curiosity and grow problem solving skills though critical and creative thinking. Somewhere in the middle of this from 2007-2009 we spent two years as volunteers with the United States Peace Corps in South Africa living and working in little village in the Limpopo Province called Mokuruanyani. Here Susie built an after-school girls club with the local women educators and caregivers to empower grade 7 girls and Ben worked as a teacher-trainer and brought a functioning computer lab and training program to the village. Upon returning from Africa we spent five years in Oakland and San Francisco while Susie worked on and received her Masters from San Francisco State University in Recreation with an emphasis in young women’s empowerment through outdoor adventure programming and Ben taught at Mission High School. We moved back to Washington for four years to be closer to family members and are now returning to to the Bay Area. We are coming to Pleasant Hill Cohousing from Bellingham Cohousing where we lived for our last four years in Washington State. During this time in 2016 our youngest was born, Acacia. She is a joy who loves exploring our world, dancing, swinging and laughing. Previously In 2013 Nova was born in Walnut Creek. Nova is our little analytical man who wants deep answers to deep questions. He is a storyteller who enjoys a good audience and is an amazing big brother to his little sister. We have been living here since the fall of 2003, but involved with the group since early 1999. It was great to move into a place where we knew all the neighbors and their kids! I (Veena) love that I get to spend time with the kids when I want to and have on occasion organized some craft projects for them, which can be so much fun. The original 'girl pack' are teenagers now! And being able to just knock on a neighbor's door to borrow anything (soymilk, onions, muffin tray, food dehydrator are all recent examples) reminds me of my childhood growing up in India where this is a common occurrence. Murthy and I are vegans and enjoy cooking the occasional vegan common meal for the community. We also have learnt permaculture and try to grow some food in our tiny backyard. I am on the "Decision Log Committee" (responsible for maintaining a log of all the decisions the community makes) and the Cold Water Team (periodic maintenance of our sprinkler system) Murthy is part of the Computer Connection committee (the committee that maintains our ingeniously laid broadband community network), the Cold Water and Hot Water teams and is also on the Garden Committee as time permits. 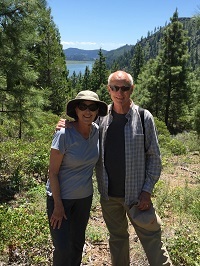 We both enjoy going on hikes, and helping neighbors out when there is a need and living in community. 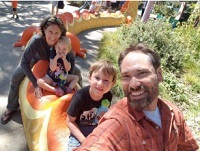 Our family joined the Pleasant Hill Cohousing community in 2013 when our two boys were in preschool. Our boys are going to be fifth and third graders in the fall of 2018. They are currently homeschooled by their mom, a full time homeschooling teacher. The boys are busy learning various languages and other subjects, in addition to the California standardized education. They are bilingual and hope to be tri-lingual in a few years. Their dad works in an environmental field to protect our natural resources. We love hiking, swimming, kayaking, biking, camping, learning new things, and going to new places to further educate ourselves to be nicer to the earth. I'm a semi-retired professional violinist, classical (performed for many years with the San Francisco Ballet Orchestra, Fremont Symphony, and other Bay Area groups) and jazz. I've recorded 4 jazz CDs. I'm currently active in the jazz-crossover trio Florio and the jazz quartet West Coast Standard. I also love playing for community events like our Winter Solstice celebration. I have been a participant in the UNtraining (untraining White liberal racism) and a member of Welcome to the Table, a racial reconciliation circle, for over 5 years. I also participate regularly with Jewish Gateways, a Jewish learning and celebration network. Other interests include hiking, cooking, group singing, and the group-process aspect of community building. I found out about cohousing about 25 years ago, and knew it was the way I wanted to live. I worked for several years with a group in Marin County (where I lived for 30 years), trying without success to create cohousing there. When the Pleasant Hill group found our site, I joined, realizing that it was my best chance to make my cohousing dreams real -- even though it meant relocating to a part of the Bay Area that was wholly new to me. I was one of the first people to move in when our homes were completed, and have lived here ever since. I am currently active on our Facilitation Team, Outreach Team, Financial Advisory Team, and Garden Committee. Over the years I have lived here, I have had some difficult moments, but no regrets. I like and respect all of my neighbors, and feel that I can be real with them. I love the spontaneous social activities that happen because we're all here. I am fascinated and challenged by the consensus decision-making process. I continue to hold to the vision of living in a creative, resourceful community where there is a commitment to resolve conflict peacefully, transcend differences, and create win-win solutions. As an older single woman, I also enjoy living in a multi-generational community that includes children.